The experiments at the Large Hadron Collider have now collected over 3/pb of data each. This plot shows the integrated luminosity collected by ATLAS as 2.83/pb but you can add 0.28/pb from the current overnight run which will continue to collect data this morning. Physics runs will go on until Monday morning when the collider will be shut down for a regular start-of-month technical stop. There had been some debate among the beam controllers about whether or not to increase luminosity further before the stop, but it was decided that the priority should be to perfect the injection procedures. There are now 9 weeks left to increase the luminosity before the LHC is turned into a heavy ion collider during November. In that 9 weeks the luminosity must be increased from its current peak value of 10/nb/s to 100/nb/s . That will be equivalent to 3/fb per year and they want to collect 1/fb in 2011. When you take into account the luminosity decay, and available running time you find that they really need twice that luminosity to achieve their goal, so either they will have to increase luminosity further in 2011, or settle for less than 1/fb of data. To get to higher luminosities they need to perfect the injection procedures so that they can pack the proton bunches into the collider ring more closely. They have recently debated whether to aim for injections with a spacing between bunches of 75ns or 150ns (22.5m or 45m). The decision is to aim for 150ns separations because it avoids parasitic collisions. These are collisions between the bunches that happen outside the normal collision point when the angle at which the beams cross is not sufficient to keep them apart. Such collisions produce false signals in the detectors and may produce radiation in unwanted places that age the equipment. With 150ns separations they can fit a maximum of 384 bunches into each beam which should be enough to increase the luminosity to 100/nb/s. However the plan is still tight and they cannot afford to lose much time to unplanned stoppages. Otherwise they will be left with more work to do when they restart next year making it even harder to hit the 1/fb target. The work to complete the injection method has already been held back due to a problem with the UPS systems so they cannot afford further delays after the technical stop. This entry was posted on Sunday, August 29th, 2010 at 8:04 am and is filed under Large Hadron Collider. You can follow any responses to this entry through the RSS 2.0 feed. Both comments and pings are currently closed. 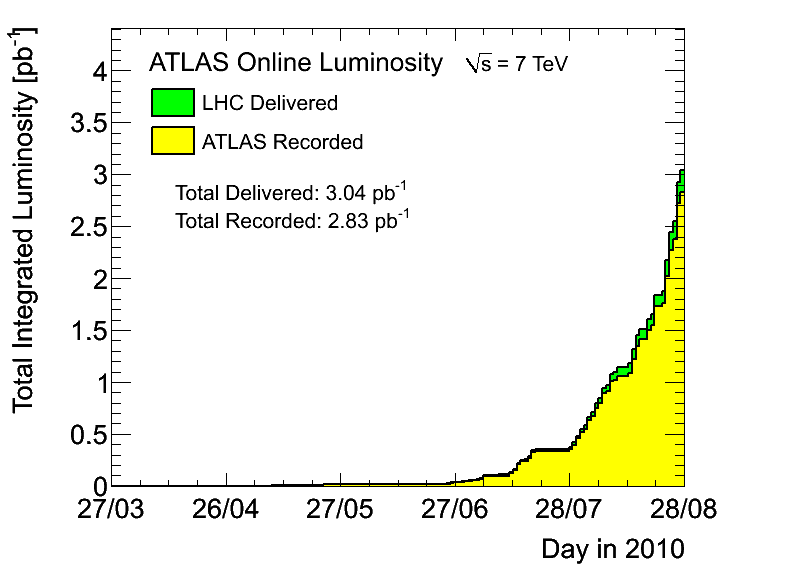 Is it just my feeling that the LHC didn’t do any physics for a week or so? Yes, it has been nearly two weeks in fact, but it was shown on the plan above. The green part was a 4 day “technical stop” that they do every six weeks or so. The blue part is a further week of setting up for bunch trains with 150ns between bunches. Once they have that working smoothly they are ready to build up to 384 bunches/beam. 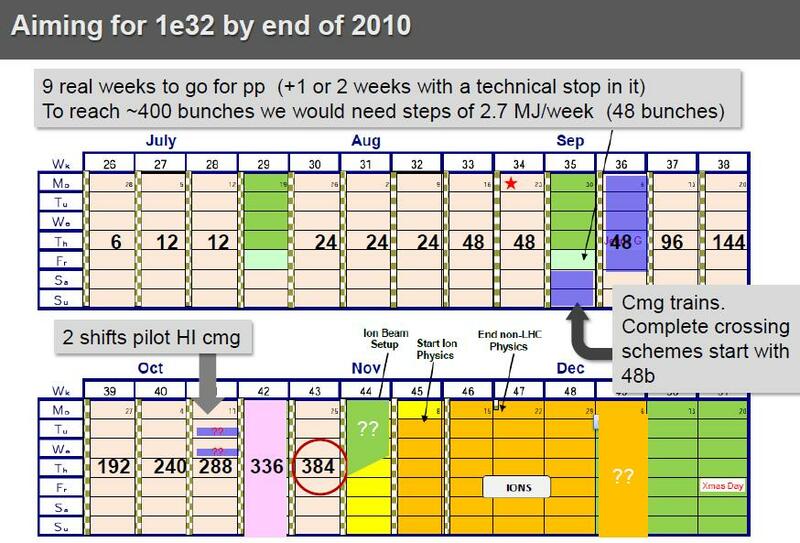 As you can see from the plan they intend to increase by 48 bunches each week, then just when they have it working nicely they will stop to do some heavy ion physics during November. They may be a few days behind the plan, but we should see some progress soon. In a few days they should be back with 48 bunches but will be injecting 12 at a time instead of 4 at a time. Another part of the commissioning process they are going through this week is to increase the crossover angle. This reduces interactions between the bunches in different beams, which otherwise would affect beam stability. It all takes time to get it running smoothly, but once its done they can go to more bunches with only minor adjustments. After 384 bunches per beam they will need another period of commissioning like this before they can go higher still, but they have not said when they would do that. Where the beams come together in the detectors they squeeze the beams to a narrow focus in order to increase the luminosity. beta* is a measure of how much the beams are squeezed. It is actually the distance away from the collision point at which the beams have twice the width that they do at the collision point. Currently they squeeze down to a beta* of 3.5m. When they go to 7 TeV per beam they will be able to squeeze further to 0.5m and that should improve luminosity by a factor of about seven.